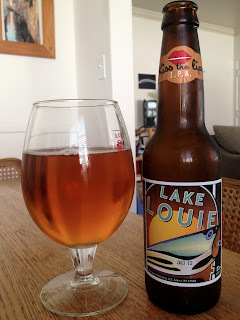 Wrapping up the Wisconsin Beer Plow with another IPA from a brewery outside Madison that is not, as far as I can tell, near any obvious body of water named Lake Louie. Oh wait- the website says that Lake Louie is a quarter-acre pond. No wonder it barely registers on Google Maps. That's actually pretty awesome, to name your brewery after the little puddle out back. Smell-wise, it reminds me of a lot fo the IPAs I had in the craft beer club last year- which isn't really a compliment, unfortunately. The malt part smells OK, just a touch sweet, not overwhelming at all. But the hops smell pretty rough, with that whole dirty aspect that generally makes me a bit apprehensive. I've been wondering if my use of the word "dirty" corresponds to "earthy", the latter of which I see in a lot of beer reviews. Though it generally seems to be used as a positive in those reviews, whereas dirty is definitely not in mine. But whatever. Flavorwise, yeah, it's not great. The bitterness is pretty rough and without much flavor. Thankfully it's not palate-destroying, because if it was it'd be pretty much undrinkable. I suppose the weight of the malt is pretty decent and balances the hops to a reasonable extent. I'd say the best feature is the nice light body. But it just doesn't taste like much- it comes off like an IPA made by a brewery whose expertise lies elsewhere. Well, this was sort of an anticlimactic end to the Wisconsin Beer Plow. Probably should've held on to the Illumination to review last of these IPAs, but I've never been good at saving the best for last.